When space became short in Swiss Re's five branch offices in midtown Manhattan and the leases were expiring, the company decided to look for a new location. Swiss Re opted for the peaceful town of Armonk, only about 65 km from New York City. As was the case for the Centre of Global Dialogue in Rüschlikon, preference here was given to a natural and quiet setting over a busy town centre. The complex was built in 1999 for 1100 staff members. The architects decided to build a "landscraper" rather than a traditional skyscraper: a long structure with protruding "fingers" that would "scrape" the broad expanse of land. 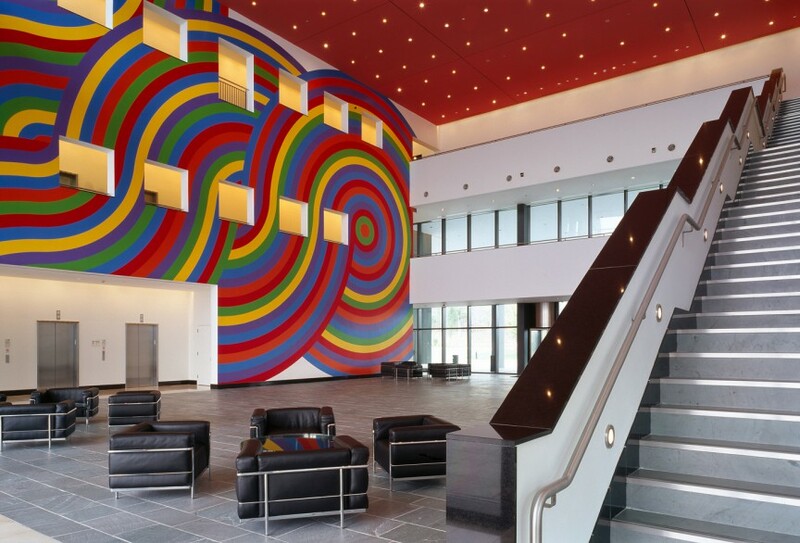 Three factors led to the Swiss architect Dolf Schnebli being awarded first prize in the competition: his vision of a generous entrance hall that would be open to visitors and directly accessible from the multi-storey car park; his idea of bright offices with outstanding views; and his plans for incorporating the entire complex into the natural surroundings. Also here the architect succeeded in blending the personality of a cutting-edge risk management company with the quiet calm of the locale.